GenXalogy: I bet you can relate to this! So, today I was at the supermarket when this completely random woman in her 40s wandered up to me and said something to the effect of "I know this sounds really weird, but I like doing nice things for strangers, and I thought you might like these flowers", and then presented me with a bunch of roses! They were very lovely, but my first thought... actually, no, my first thought was "Sounds weird? Damn straight!" My second thought was "I can't take these home. What ever will my husband think?" So, I decided I'd have to move those roses on pronto! Of course I spent a couple of minutes thinking of who is living near me that might appreciate having some impromptu flowers, but there wasn't really anyone who sprang to mind. Being a genealogist, my next thought was of course of who is non-living near me who might appreciate them. 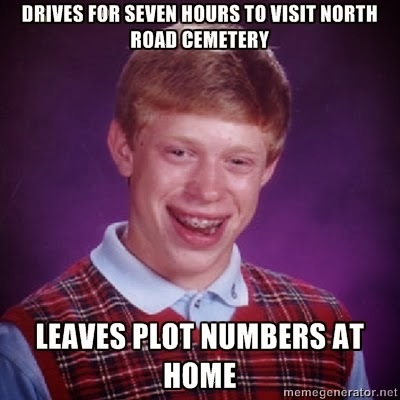 Within five minutes I was on the road to the nearest cemetery with plot numbers in hand, courtesy of Family Bee which lets me keep my family history file on my phone. I decided to pick two people (it was 42 today, so I kept it limited!) to share the roses, both mums who had lost babies. Half the bunch went to Winifred McArthur, who is buried with her daughter, Dorothy, who died at 2 days old in 1904. Winifred followed her baby to the grave five days later. I notice since I last visited the metal part of her flower holder has disappeared. Winifred's Headstone, taken last time I visited. Her husband was a Scotsman and there is a beautiful Gaelic inscription. I left the other half of the bunch with Winifred Evans, who had a baby in 1920 while she was unmarried and gave the baby (also a girl) up for adoption, no doubt in response to considerable pressure from her family and probably hospital staff as well. Anyway. The whole exercise took only about an extra ten minutes, and the flowers are now safely moved on to a more appropriate place. *phew* Crisis averted! Family history saves the day again! If only Bad Luck Brian had installed Family Bee! That is truly beautiful and inspiring... thanks for sharing.